Welcome to the JVNP 2.0 Weekend Update featuring a primary JV invite courtesy of fellow JVNP 2.0 Partners Claire Zammit PhD + Evolving Wisdom (Feminine Power 2018 live, interactive 7 week online course launch affiliate program JV invite), Buzz Builders (Ben Murray, Rohan Chaudhari + Harshal Jadhav – Reddule launch), and More … in Today’s you go girl edition. Please Join Us in Promoting Feminine Power: The Essential Course for the Awakening Woman in 2018. A 7 Week LIVE, Interactive Online Course with Dr. Claire Zammit*. *This year’s course will be offered LIVE and the launch creative will be newly updated for the first time in over 3 years! • Feminine Power has a proven track record of successfully launching over 15 times since 2010 and ushering over 15,000 students through the 7-week course. 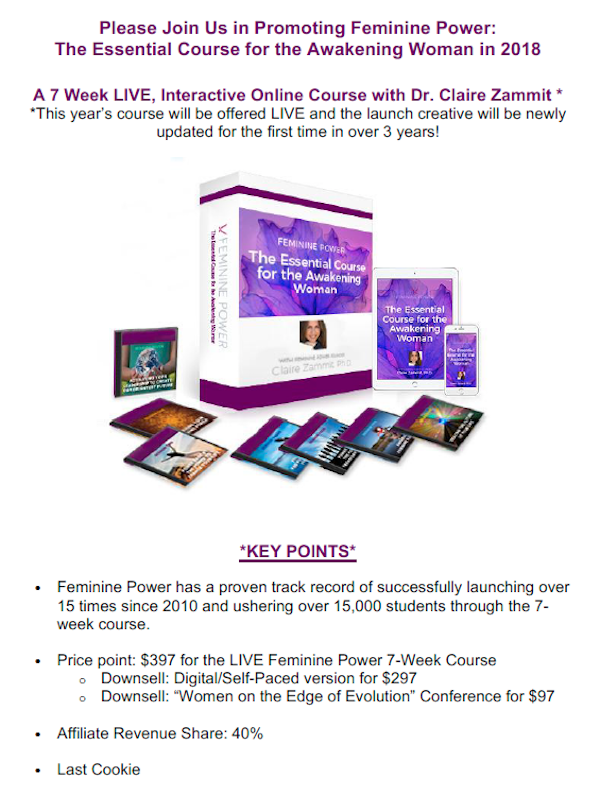 • Price point: $397 for the LIVE Feminine Power 7-Week Course. o Downsell: Digital/Self-Paced version for $297. o Downsell: “Women on the Edge of Evolution” Conference for $97. • Affiliate Revenue Share: 40%. 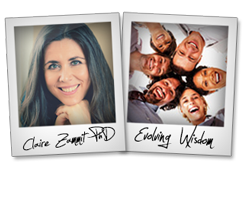 Partner with Dr. Claire Zammit & the Evolving Wisdom JV Team as an Affiliate Here. This year we’re doing something very special for our key partners who have communities of women whose focus is on Health and Well-being. We’re creating a customized opt in page and welcome page along with a replay page exclusively for health communities that position the offer with key health benefits. Stress, depression, anxiety, weight-loss and body confidence, increased energy, deeper connection to life purpose and connection to a higher power, and an overall greater sense of well-being and thriving. Your tribe members will have the opportunity to join a sisterhood of women who will be going through the course together with a focus on making big shifts in their physical and emotional well-being. Not only have graduates experienced improved confidence, higher energy, and overall stronger health, but also mentally, many have lowered stress levels significantly and are better equipped to deal with overwhelming circumstances. “Because of Feminine Power I lost 70 lbs, traveled solo in foreign countries where I didn’t speak the language, and celebrated my new body by riding elephants, zip lining, and hiking to the Tiger’s Nest in Bhutan (+12,000 ft)!” — Carolyn, Camano Island, Washington. “Since attending Feminine Power I have released a lifelong, nearly debilitating eating disorder. The course revealed to me that I get to choose how I live my life. And I choose to live free from addictions that keep me chained to the past.” — Heather, Costa Mesa, California. “Feminine Power did for me what a decade of schooling, therapy and personal development could not. My depression is gone!” — Harriet, Los Angeles, California. “Feminine Power saved my life in the sense that I am no longer just existing, I am truly living.” — Julie, El Dorado Hills, California. “I lost 185 pounds and have kept it off for more than a year now! When people ask me, ‘How do you get up at 5am to go the gym?’ I tell them, ‘Well, if you had a loved one who needed to get up at 5am because their life depended on it, would you do it?’ Feminine Power showed me how to care for myself in the same way I care for others.” — Angela Machado, New York, New York. • Acclaimed spiritual leader Marianne Williamson on the Feminine Path to Prosperity. • The extraordinary Elizabeth Gilbert of “Eat, Pray, Love” fame on Creativity. • Iyanla Vanzant on Connecting with Spirit as a Path to Power. • And Forbes’s “Entrepreneurial Woman to Watch,” Ali Brown, on how to make a living doing what you love! 100% of “Doors Closing” Registrations Donated to Charity. In the past several years, Feminine Power, in partnership with Debbie Ford’s Collective Heart Foundation, has donated more than $100,000 to fund The Girl Power Project pilot program — a leadership and self-esteem skills training for at-risk adolescent girls in Uganda, created by Vivian Glyck and the Just Like My Child Foundation. The initial vision was to impact over 10,000 girls. We’re thrilled to report that the project has been so successful and had such a huge impact that we’re now standing with Vivian in her vision to scale the program into a “Million Girl Movement”! In the final days of the campaign, we’ll donate 100% of registrations to this impactful charity. Something BIG is happening for women that’s so significant we can no longer ignore it. Millions of women are feeling the impulse to unlock their creativity, vision and voice. In working with over 500,000 women from over 100 countries, I’ve come to see that Feminine Power is the KEY to unlocking this potential that we’re all feeling. You see, for over the past 50 years, women have been mastering a logical, linear, masculine power system that has enabled us to create things at an unprecedented rate that are predictable and controllable. • True love • Intimacy • Spiritual connection • Self-expression • Creativity • Fulfillment of our destiny or higher calling • An enlightened world for the generations to come … The things that require Feminine Power to bring them forth. When I discovered this, I made it my mission to awaken this power in every woman. An extraordinary tribe of creative, gifted and talented women from all over the world will be coming together to find their wings and make the leap into this new feminine operating system. In just 7 weeks, I’m going to personally guide and mentor them through the exact, step-by-step process over 15,000 women have been through, which took them from sensing a greater possibility for their lives to living in the center of their destiny. This online course offers the most effective training tools I know, plus the latest research and information on how our inherent feminine power can radically and joyfully transform our lives—and the future of the entire world! — Unlocking the Three Power Centers — which you won’t find anywhere else. Throughout this program, women access to the tools, training, and the deep, ongoing support that they’ll need to create those things they most yearn for, such as higher creativity, self-expression, meaning, purpose, aliveness, love, intimacy, connection, belonging, contribution, and a brighter future for generations to come. When we unlock the Three Power Centers of Feminine Power, you tap into your own vibrant energy source, insight, inner wisdom, and so, so much more. • You will connect to the deeper truth of who you are and the story of your power as a creator of your life. • You will discover and start living into your higher purpose. • You will feel a sense of authentic confidence in your ability to attract and create the resources you need to thrive. • Your relationships will begin to mirror and match your true value. • You will discover how to express your gifts not for just self-expression’s sake, but in ways that go on to really impact others where they feel valued and received. • You will begin to feel spiritually connected and attuned to your own inner compass and develop an unshakable bond with your intuition. • In a very powerful way, you will begin to show up in ways that empower your family, your partner, your children, and your community so they start to show up and flourish and thrive. How can you expect the lives of women in your community to change by participating in the Feminine Power course? 1. They Discover Their Life Purpose. 2. They Create More Prosperity in Their Lives. 3. They Create Careers that Mirror their Passions. 4. They Improve their Health & Well-Being. 5. They Unlock their Creativity. 6. They Enjoy More Satisfying Relationships. 7. They are Supported by a Worldwide Sisterhood. Feminine Power is within all women — just waiting to be awakened and unleashed! Claire Zammit Ph.D., is the leading authority in the world today on Feminine Power and an expert transformational teacher, leader, mentor and successful conscious entrepreneur. Her mission is to empower women to fully express their gifts and talents by sharing the Feminine Power teachings that she created and that she credits as the source of her own fulfillment, success and impact. Claire is also the co-founder and president of Evolving Wisdom, which was recognized by Inc. Magazine as #83 on the list of Top 500 fastest-growing companies in America. Since 2009, Claire’s work with Feminine Power and Evolving Wisdom has reached more than 1 million people. In addition to her teaching work in the Feminine Power courses, Claire has shared the stage with such luminaries as Elizabeth Gilbert, Brené Brown, Eve Ensler, Alanis Morissette, Marianne Williamson, Marci Shimoff, Neale Donald Walsch, Gabrielle Bernstein and Lisa Nichols. >>> Gain Access to Your Affiliate Tools & More Here. Let 3 Top ClickBank Marketers Help You Earn Your Biggest Commission Check of the Year! What happens when you combine $1200+ commissions, over $100,000 in prizes, and 3 of the most successful ClickBank marketers of all time? One of the BIGGEST launches of 2018, spearheaded by Mark Ling in partnership with Gerry Cramer and Rob Jones. Don’t miss this one! Mark Ling, Gerry Cramer + Rob Jones – Profit Engine JV page. JVZoo #1 Top Seller! Jump on Board the Launch of the First “All-in-One” Software to Help Automate Traffic and Leads from Reddit! Reddule is the first “all-in-one” software to help automate traffic and leads from Reddit while fully using the Reddit API. It’s the first to allow keyword alerts, scheduling, Karma analytics, and many more powerful features to help users safely get results and build long-term brands. Check out the JV page for a demo, prize information, and more! => Ben Murray, Rohan Chaudhari + Harshal Jadhav – Reddule JV page. John Di Lemme, Sara Young + Andrew Hansen, Rob Thompson, Travis Stephenson, and other fellow JVNotifyPro 2.0 partners are waiting in the wings … keep your eyes on your Inbox, and follow the action in the JVNP 2.0 Premium VIP JV Announcement archives.